Restore, protect and polish your hair with this uplifting, nutrient-rich, aromatic oil. 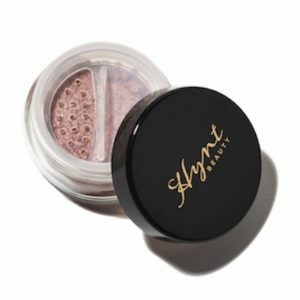 A little pot of opulence; a big hug for your hair. Keeping the correct moisture balance in place enables each strand of hair to be more malleable and move freely, leading to maximum control, and fabulously buoyant hair that is full of life and lustre. It will make your hair look and feel younger. Soil Association Cosmos Organic certified. 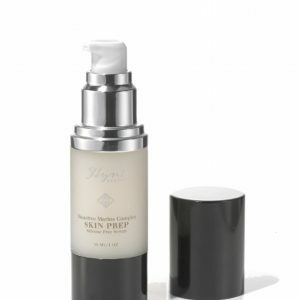 Apply 1-2 pumps, dependant on hair length, to wet or dry hair. Leave for a minimum of 10 minutes. Cleanse the hair thoroughly to remove the excess oil. 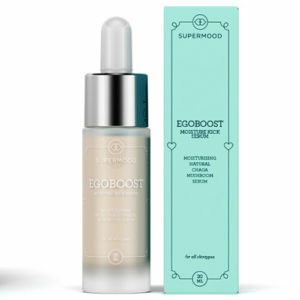 For a really nourishing effect leave in overnight. Apply a micro amount and warm thoroughly between your palms until the oil has started to absorb into your hands. Apply the micro amount of oil to the mid-lengths and ends of the hair. 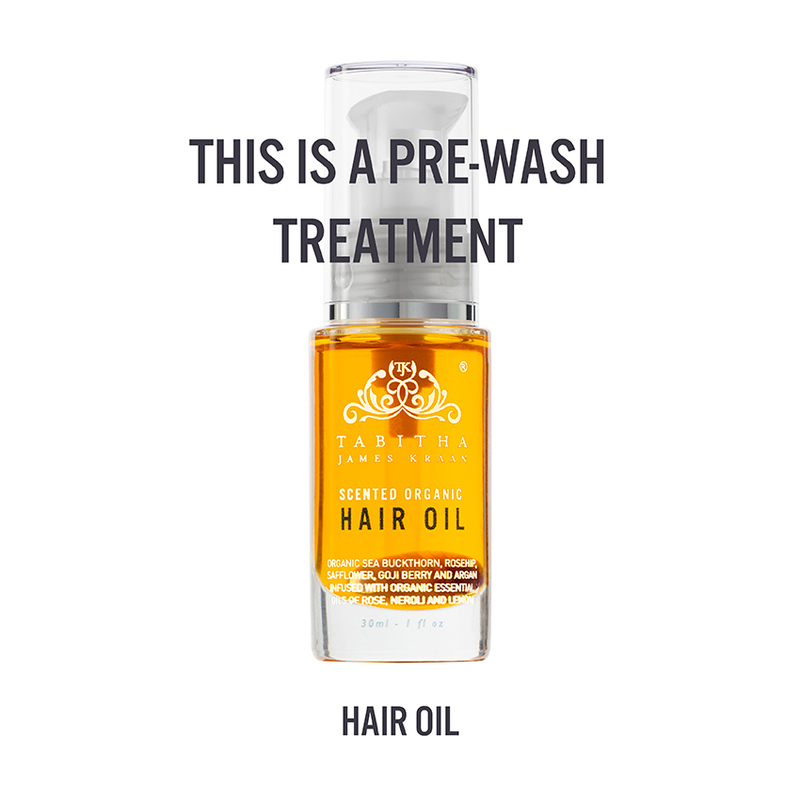 It will give the hair weight, body and shine, whilst protecting and increasing moisture balance. Use the treatment weekly to varnish hair increasing its colour vibrancy as well as to smooth, strengthen and moisturise. 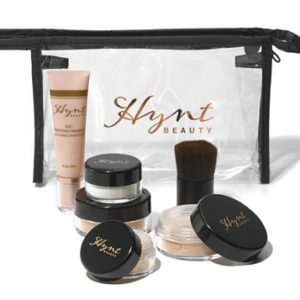 Once you achieve a good moisture balance it is vital to keep it there. 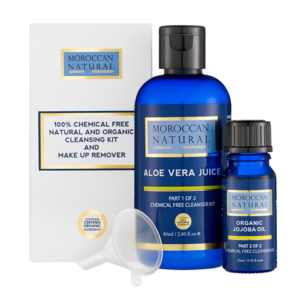 Our hair becomes dehydrated from over washing as well as winter heating and summer sunshine. It is important to put the moisture back and then keep topping it up to achieve maximum hydration. This is when our hair really performs for us. This product is a super moisture boost for all hair types. It will seal the cuticle and rehydrate each strand which I believe is the key to fabulous hair. Apply our 4-in-1 conditioner daily on wet or dry hair to top up the moisture protection. Use as a regular scalp treatment: Massage my Scented Hair Oil into the scalp to balance the oil production. The scalp responds by producing less oil over time. Apply 1 pump. Massage into the scalp 30 mins before washing. Cleanse the hair as usual. 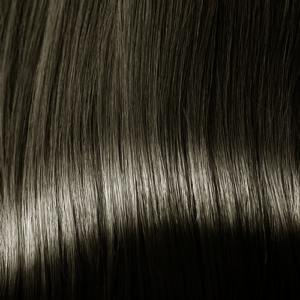 The oil will give weight and volume to fine hair and a smooth silky glossy finish to thick hair. It will make everyone’s hair glossy and richer in colour, stronger, protected and easier to blow-dry or style. Soil association certified cosmos organic with certified organic sea buckthorn, safflower, rosehip, goji berry and argan oil, infused with organic essential oils of rose, patchouli and ylang ylang. 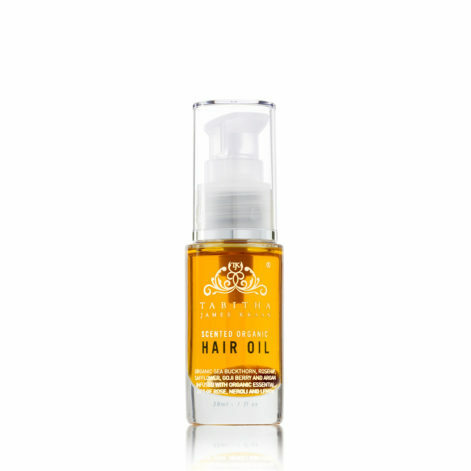 Restore, protect and polish the hair with this expertly formulated nutrient-rich and gloriously scented Organic Hair Oil. 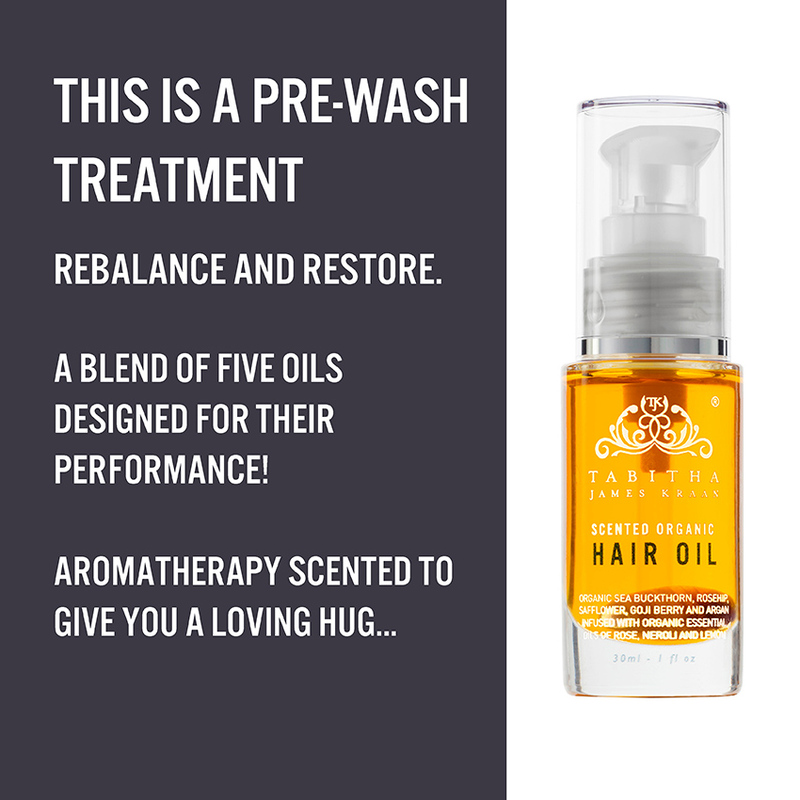 Use before washes, as a treatment or wear to varnish, moisturise and nurture hair that has been stressed by lifestyle and styling. 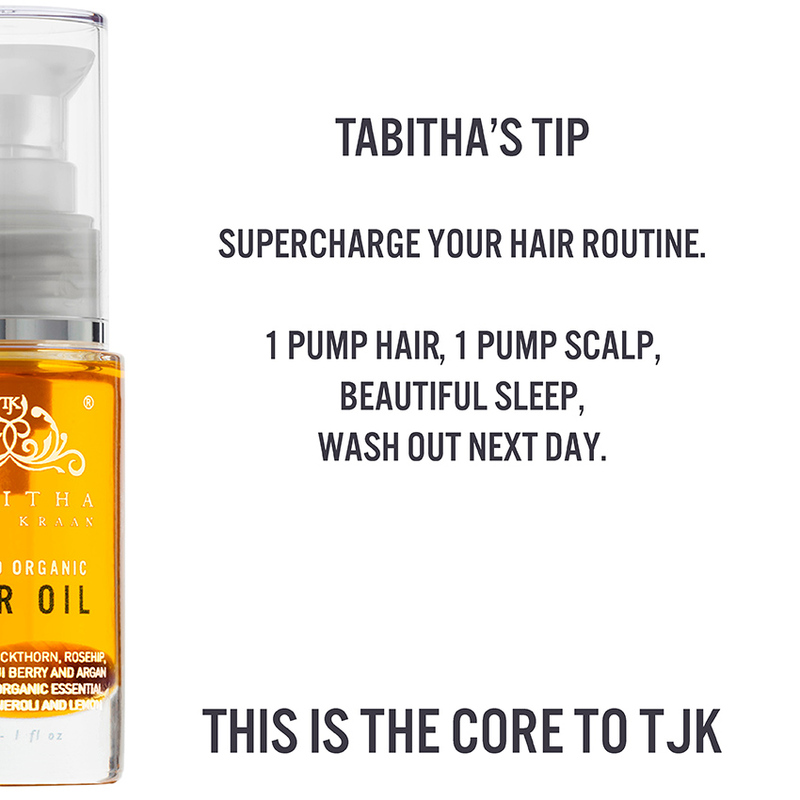 Be the first to review “Scented Organic Hair Oil By Tabitha James Kraan” Click here to cancel reply.